Dissolve the dry yeast in a glass of warm water that you take from the 480 g.
Mix white flour and gluten flour and add to the bowl. Scrape the flour to make a mountain of flour in the middle of the bowl. Add the salt to the base of the flour mountain, around the outside of the bowl, then break up the mountain to cover the salt and make a well in the middle of the bowl. The idea here is that yeast and salt should not touch immediately. Add the yeast into the well and then the rest of the water. Use the kitchen mixer to knead. Once all dry ingredients are incorporated, turn the mixer on a fairly high setting, higher than your usual kneading speed, for a minute or two until you see the dough break away from the sides of the bowl. Then return to highest kneading speed and knead for 10 minutes. For example: my Bosch has speeds from 1 to 7. Kneading is 1 to 3. I start with 1, then, when there’s no more visible dry flour, turn to 5 for a minute or so, then turn back to 3 to knead for another 10 minutes. Give your work surface a spray of oil. Do not use any flour in the next steps. Do another set of 15 to 20 French kneading turns. The dough will be a lot more elastic and less sticky. Do another set of 15 to 20 French kneading turns. By now there should be visible air bubbles that don’t break but can be quite large. If not, repeat the resting and kneading. Oil a large bowl and place the dough into it. Cover and let the dough rise to at least double its size. How long that takes will depend on the ambient temperature and how much yeast you used. It will taste nicer with less yeast, but will be faster with more. When it’s really cold, I turn the oven on for a few minutes on 50 deg Celsius, then turn it off, leave the oven light on and put the bowl in the oven. When the dough has risen, put lots and lots of flour on your work surface, then tip the dough out and let it spread. Dust with flour and use a dough scraper to divide into 6 approximately evenly sized pieces. Fold each piece gently from the left outside to the center and from the right outside to the center and pinch the touching sides together to form a seam. Try not to handle the dough too much, because each air bubble is precious. But it’s OK to stretch the folded loaf into a longer shape. Just hold it up at one end and let gravity pull it a bit longer. 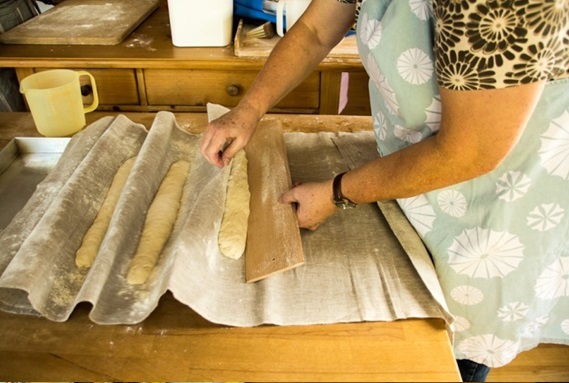 Place shaped loaves on a piece of baking linen dusted with plenty of flour, seam side down. Pull up the linen between the loaves, so they don’t touch. Cover with a towel and let rest for another hour. The loaves will probably deflate a bit, but they’ll come around again in the oven. Let the loaves rest a little bit on the baking paper, while the oven heats to 180 – 190 C. Put a bowl with hot water into the oven. Pull the baking paper sheets onto two baking trays and put them into the oven. Turn the oven to fan bake. After 10 minutes, swap the upper and lower sheets and rotate them front to back. Give them another 7-ish minutes. Watch them. Every oven is different. You don’t want them too dark. I normally double the recipe above and get 12 breads.